All countries need access to a constant supply of genetic resources to be able to develop new varieties of crops, especially to meet the challenges of climate change. The International Treaty on Plant Genetic Resources for Food and Agriculture, created under the auspices of the United Nations and administered by the Food and Agriculture Organization (FAO), recognizes countries’ rights over their genetic resources. The associated Multilateral System of Access and Benefit Sharing promotes the sharing of the germplasm. Through the Multilateral System, countries can share crop genetic diversity for agricultural research and crop breeding. Effectively, the Multilateral System creates a truly global pool of genetic resources for countries’ agricultural development and adaptation to climate change. Scientific support in accessing this system will provide greater opportunities for Costa Rica, Nepal and Uganda to develop new crop varieties that will cope better with projected climate change. Experts from CCAFS assisted national government agencies in Costa Rica, Nepal and Uganda to sign on to the International Treaty on Plant Genetic Resources for Food and Agriculture (ITPGRFA) and the Multilateral System. Each country generated national policies that facilitate the exchange of genetic resources with other countries belonging to the agreement. In Costa Rica, CCAFS national partners drafted and negotiated a memorandum of understanding among national agencies after a programme of research, awareness-raising and capacity-building activities. The partners were the National Commission on Plant Genetic Resources (CONAREFI), the Centro Agronómico Tropical de Investigación y Enseñanza (CATIE) the National Institute for Innovation and Transfer of Agricultural Technologies (INTA) and the Ministry of Agriculture. To reach agreement, Bioversity International staff and national partners produced ground-breaking reports on the importance of genetic resources for Costa Rica’s production of food security crops; the dependence of Costa Rica on other countries' genetic resources of these crops; and the potential importance of such genetic resources in assisting with the development of crops that are better adapted to climate change. In Nepal, partners, including the Nepal Agricultural Research Council (NARC), the Ministry of Agricultural Development (MoAD) and Local Initiatives for Biodiversity, Research and Development (LIBIRD), led the process of revising the National Agrobiodiversity Policy to allow the country to join the System. A series of consultations with ministries and other stakeholders showed how access to material from other countries will become increasingly important for Nepal to adapt to changing climatic conditions. This created the authorizing environment for the Cabinet to approve the new policy and action plan. In Uganda, CCAFS involvement overcame a policy bottleneck that had existed for many years, where no organization was clearly recognized to have authority to provide access to the country’s plant genetic resources. A negotiated agreement among 3 lead agencies defined responsibilities and regulated access to the resources and benefit sharing. Once that agreement had been reached, national institutions and CCAFS partners, with the support of Bioversity International, prepared Uganda’s first list of crop germplasm to be made available through the Multilateral System and notified the Treaty Secretariat accordingly, creating the opportunity for users in Uganda and around the world to access germplasm conserved in Uganda. In 2015, agriculture gained prominence in the global climate agreement, and CCAFS science increasingly informed initiatives to enhance millions of farmers’ resilience to climate impacts and help them reduce emissions. 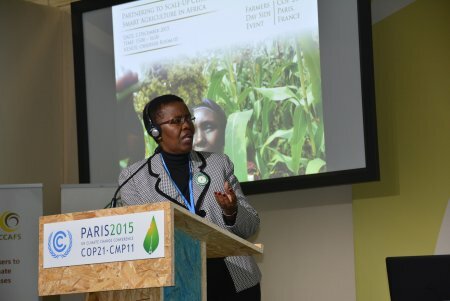 In East Africa, CCAFS scientists are working closely with national policy partners to develop climate plans, through future scenario approaches combined with agricultural economics models. At the same time, ICRAF, CIAT and ILRI are helping countries plan large-scale investments in climate-smart agriculture. In Kenya, ICRAF worked with the dairy sector to develop and disseminate climate-smart practices that can reduce emissions, and ILRI has bred new climate-smart ‘super’ goats that are less vulnerable to drought. In Uganda, IITA helped clarify the impacts of gender-sensitive programmes on a household’s investments. To help farmers plan in unpredictable climates, CIMMYT, ICRISAT and CIAT helped develop a user-friendly forecasting system. In West Africa, CIAT science helped climate-proof investments in coffee and cocoa production, while IWMI and ILRI heped farmers establish climate-smart farming systems through integrated water storage and crop-livestock systems. CCAFS scientists looked at ways to develop mobile phone apps that deliver locally-tailored weather and climate information. A new regional climate-smart agriculture alliance was launched, informed by scientific outputs from a range of CGIAR centers and partners. And Ghana used a framework developed by ICRISAT, to design and implement its national climate-smart agriculture and food security action plan. Journalists from Senegal learned about climate information services and climate-smart villages through an interactive workshop and field trip. In Latin America, CCAFS scientists are working closely with national policy partners to develop climate plans, through future scenario approaches combined with agricultural economics models. In Colombia, CIAT supported local committees with vital scientific information that goes directly to farmers and decision makers, and worked with governments to incorporate gender perspectives into their livestock mitigation policies and programs. A summer school hosted by CIAT and partners helped promote climate change mitigation in smallholder crop and livestock systems in the region. Bioversity and partners helped Costa Rica safeguard its supply of genetic resources, that will help develop new climate-resilient crop varieties. 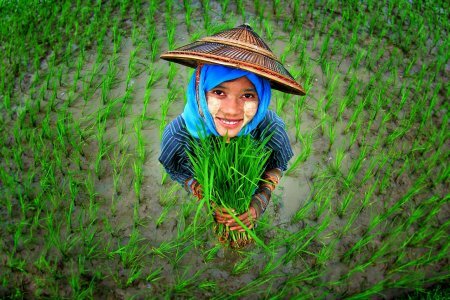 In Southeast Asia, CCAFS scientists worked closely with national policy partners to develop climate plans, through future scenario approaches combined with agricultural economics models. IRRI supported journalists from the region to become more informed about climate change issues. Myanmar used a framework developed by IRRI, to design and implement its national climate-smart agriculture strategy. CIAT trained northern Vietnamese farmers to collect vital local geographic information that will support planning of climate-resilient farming methods, and helped farmers learn about the benefits of intercropping cassava with forage grasses, that improve production and soil fertility. IRRI scientists helped Vietnam’s government make plans to scale up the use of an innovative water-saving, emissions-reducing technology for rice production. In South Asia, India has put into place important policies to safeguard farmers from climate impacts, with 11 million farmers now covered by improved weather-based crop insurance, and 500 new climate-smart villages launched in Haryana’s rice-wheat systems. CIMMYT, IFPRI and IWMI have all contribute to this large-scale success. In Bangladesh, IRRI scientists helped the government make plans to scale up the use of an innovative water-saving, emissions-reducing technology for rice production. In Uttar Pradesh, India, IWMI has developed an innovative system to excess water during rainy periods and store it in natural aquifers underground. In Nepal, Bioversity and partners are helping to safeguard the country’s supply of genetic resources, that will help develop new climate-resilient crop varieties. CCAFS scientists produced 305 publications in 2015, including 140 peer reviewed journal articles, 85% of which were published in ISI journals, 56% of which were open access. Livestock and the environment: What have we learned in the past decade? Gendered perceptions of land ownership and agricultural decision-making in Ecuador: Who are the farm managers?